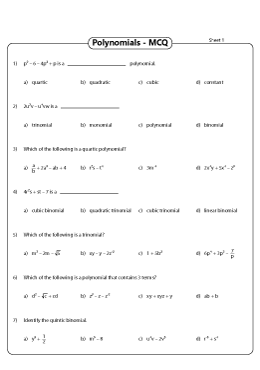 Once you have mastered in Recognizing Polynomials and Degree of Polynomials, learn to classify the polynomials with this gamut of extensive worksheets. The exercises on this page include identifying the types of polynomials based on the number of terms and the degree, naming the polynomials, MCQs, matching polynomial and its name and more! Categorize the polynomial expressions as monomial, binomial, trinomial or polynomial based on the number of terms they contain. A wide range of polynomials consisting up to six terms is presented here. Get students to classify the polynomials based on their highest exponent such as linear, quadratic, cubic, constant, quartic, quintic, etc. 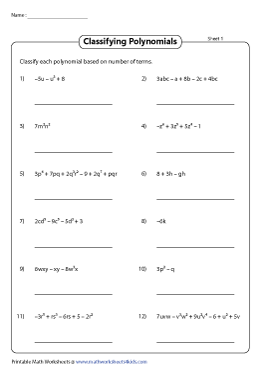 Employ these worksheets to reinforce classification of polynomials based on their degree and the number of terms. Order them first by degree followed by the term. 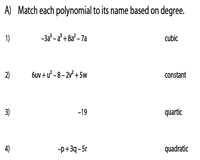 Pair up each polynomial expression to its name based on the degree / number of terms. Test your skills with these two types of worksheets. Employ this set of worksheets as an effective way to assess learning outcomes. Choose the correct degree / leading coefficient / number of terms or types of polynomial from the given alternatives by eliminating the distractors.